Communicating incidental findings is a significant challenge for radiologists. Without an efficient, clearly defined process for alerting primary care physicians to suspicious findings, follow-up exams can be missed, leading to potentially negative outcomes. Faced with the difficulty of identifying which patients require follow-up and a lack of user-friendly options, the Abington-Jefferson Health system, located in southeastern Pennsylvania, decided to develop its own process. Abington-Jefferson Health performs approximately 500,000 radiographic procedures each year. Philip S. Lim, MD, chair of the department of radiology at Abington Hospital in Abington, Pennsylvania, and a radiologist in the department of radiology at Abington-Lansdale Hospital in Lansdale, Pennsylvania, both part of Abington-Jefferson Health, wanted to track the patients who undergo X-ray and CT of the chest and abdomen to identify patients with lung nodules who are recommended for follow-up. The health system purchased software that mines radiology reports to look for follow-up recommendations, but the IT staff was stretched thin and unable to help implement it. "So I talked to my billing company, Healthcare Administrative Partners (HAP), and asked if this was something they would want to do, and they felt it was a great opportunity," Lim says. "That's their core business—identifying patients and addresses and who the primary care doctors are—so it was a natural strength for them and something that we could really partner together with, to use this software and try to track patients." Lim says the initial rollout was tedious and required significant time. He spent many hours over the course of a year reviewing analytics with Sharon Taylor, CPHIMS, chief clinical informatics officer for HAP, on cases the software flagged. In addition to making sure society guidelines, such as Fleischner criteria, were being used and reconciling new guidelines with older ones, they had to figure out how to close the communication loop with doctors and patients. It soon became obvious that a different solution was needed. "The software that RGA [Radiology Group of Abington] first started with did a great job of finding overdue follow-ups, but we couldn't drill down and find out which ones were lung nodule related," Taylor says. "So one of the biggest hurdles was trying to identify those cases, and that took writing profiles in lung-specific language. We hired a developer to help us with it at that point." In addition to Taylor, Lim relied on a core team of people to develop the lung nodule program, including the chief patient safety officer, a couple of administrators, the chief medical information officer, a radiology director, and a surgical resident who was working on a parallel project to identify incidental findings in trauma patients. The software is now able to find patients with lung nodules by looking at combinations of words in radiology reports. It can also generate letters that are sent to referring physicians and patients, alerting them of the need for follow-up. Although the new workflow works as Lim envisioned, the initial response from referrers was mixed. "The primary care doctor would get the letter from HAP notifying them that their patient had a follow-up study that might be needed, and, a lot of times, they were unaware that the report was done," Lim says. "The report never got to them, or the patient was an inpatient, so they were in a bit of a quandary being responsible for findings that they never even knew about." To build support for the program, Lim went to the hospital's leadership to explain the benefits. He demonstrated that, by closing a significant communication gap, the program not only improves patient care but also saves time. Now that referring physicians have had some experience with it, they view it much more positively. "There was a little bit of pushback by the primary care doctors, but the vast majority really embraced it, and I think it has cut down a lot of the extra work that some of their offices or programs within the hospital had been trying to manage," Lim says. "Initially, we had a nodule navigator nurse practitioner who would get the reports from radiology because we would tag a report that would go into a bin to be mined. She had lots and lots of spreadsheets, and it was a huge challenge for her to keep track of all of these patients, on top of trying to manage the more urgent patients who had large or suspicious lung nodules and really needed to get to biopsy. It was a lot of extra work that she needed to do—which, in reality, was completely duplicated by what we were doing. So we just took that all off of her plate, and we are completely managing it through our billing company." The lung nodule program increased follow-ups by more than 30% between 2015 and 2017, Taylor says. In addition to mining all X-ray and CT reports related to chest or abdomen exams, smokers and former smokers are followed closely; the program uses Lung-RADS guidelines to categorize nodules and determine appropriate follow-up dates. If a patient hasn't returned by the due date, a letter is sent to remind them. The program has also been expanded recently to cover placement of inferior vena cava filters and nodules on the adrenal glands, kidneys, and liver. Taylor says she and Lim have taken steps to analyze data related to productivity as well. "One of the things that really struck me recently is when you ask people in radiology what quality is, it's not defined. They can't really put their finger on it," Taylor says. "So we've looked at a number of different ways to analyze the data. Dr. Lim and I are working on something right now that's going to be of benefit to the hospital." Lim agrees that programs such as this can help radiology demonstrate value, not only to health care providers but also to patients. He sees this as a step toward putting patients at the center of health care and empowering them to participate in their care. He adds that the partnership with HAP has opened doors that were previously closed. "It's using the IT tools and knowledge of radiology and the expertise of the billing company to help navigate through the problem. 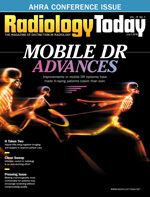 I really think that radiology revenue cycle managers have an incredibly powerful role in population health, and I think that they have the foresight to help with developing analytic tools with the data goldmine that they're sitting on," Lim says. "We have developed a solution that the hospital could not develop itself because it did not have the bandwidth or the knowledge to do it, and helping to develop this analytics product has been an incredible journey and a learning experience for me. I think the amount of impact that this has had has been immense."